The concept behind Blood’s Voice is great. I love the story line. Each character, whether it’s a main one or a secondary one, carries their weight throughout the book. As Anya’s memories finally start re-emerging and things get pieced together she discovers that she was being used as a weapon. It is the love and strength of the characters that help her through the "finding out who you really are" stage. To see the entire Review at Sapphyria’s Book Reviews click HERE or on any banner. Make sure to take a peak around . . . I just love her site! GP: Why A Broken Vamp? Hello! First I wish to thank Emma for the invitation to do a Guest Post here on The Writer’s Voice. My name is Áine P Massie and I am the author of the House Millar series – Blood’s Voice and Blood Bound. One question I get over and over is why paranormal and ‘seriously, why a broken vamp?’ I always find these questions and the theme to be a bit odd. Why does anyone write in a specific genre, or even read a certain type of book? . . .
To see the entire Guest Post over at The Writer’s Voice click HERE or on any banner. Make sure to take a peak around . . . Emma and her crew have an awesome site! GP: Characters and how they . . .
Hello! First I wish to thank Saph for the invitation to do a Guest Post here on Sapphyria’s Book Blog. 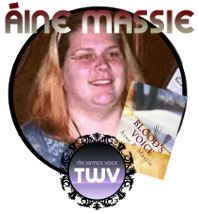 My name is Áine P Massie and I am the author of the House Millar series – Blood’s Voice and Blood Bound. To see the entire Guest Post over a Sapphyria’s Book Reviews click HERE or on any banner. Make sure to take a peak around . . . I just love her site! I know for a Paranormal Romance author my answer will seem a bit odd but hey… odd I am. The author that I am most thankful for is Dr. Seuss. Not only because his books were a wonder to me as a child but his story, his dedication and determination, and his personal convictions were and are an inspiration to me. He laboured for years before he ever managed to succeed as an author. Sure he had a lot of advertising success and such but as an author… it took an extreme amount of patience and perseverance to obtain his success. While I have not read every one of Suess’s books, he made reading fun and learning easy. He taught that people are people, no matter how different. And, he taught that the world and what lives on Her is important, not just to use but to protect. Dr. Seuss is my inspiration and my hero! And an extra (just ‘cuz I can) – Today. I am always thankful for another day that I get to spend with those I love, protecting others, and designing great things! … I was pulled right into the story. I recommend this book for paranormal romance fans for its sensual scenes and titillating drama. 4 Fairies for this unique look into vampires. To see the entire Review, visit the site by clicking on any banner or by clicking HERE. Make sure to comment, Heather loves to hear from you guys! Jayne Fresina lives in upstate New York with her long-suffering husband and three, badly behaved spaniels. She loves chocolate, wine and a good book – preferably all at once. She sprouted up in England, as the youngest and much-harassed child in a family of four daughters. Entertained by her father’s quirky, colorful tales of his own youth growing up in The Fens, and surrounded by the commotion of opinionated elder sisters – all with far more exciting lives than hers – she had plenty of material for the stories she wrote in her head. In the beginning she didn’t dare write anything down, in case people thought she was odd; instead, she soothed the creative beast by treating her family to weekly dramatic performances, from a cupboard in her bedroom – one such performance being a one-woman, musical version of “Jaws” in three acts (intervals for ice-cream, of course). For some reason she never worried that might be perceived as “odd”. As an adult she finally began writing her stories down and now spends several hours each day, furthering the adventures of her beleaguered heroes and unstoppable heroines. Much less painful on the ears, she finds, but tougher on the fingers, and if she didn’t let those characters out into the world, they would probably never give her a moment’s peace. It’s her greatest hope that you get as much pleasure from reading her work, as she gets from creating and writing it. Jayne Fresina is the author of seven (7), soon to be eight (8) books. She pens historical romance. Jayne is a writer of historical romance. Currently, she has e-books published with Evernight Publishing and Lyrical Press. In the spring of 2012 she will also have her first Regency published by Sourcebooks. She live in upstate New York with her husband and three sussex-spaniels. In celebration of Thanksgiving and Black Friday, Blood’s Voice (House Millar #1) will be on sale for only $2.99. The sale only lasts until Sunday, November 27th 2011. Take advantage of this one time only sale! You have your choice of sites and formats for this eBook – see links below for the discount sites. Hello ladies, gents, and other mythological creatures possibly lurking around! We have special guests today here at Breaking Bookshelves. Three very attractive, very wonderful, and very interesting individuals who have gone through enormous obstacles only to find themselves being interviewed here (jeeze, I’m sorry for the lackluster interview space guys). I’d like all you readers to meet and welcome Nicholas, Declán, and Anya from Blood’s Voice and Blood Bound! Hahaha, oh my~ So, on to some lighter questions? What are your favourite books? Movies? Music? Anya: Favourite? Oh, I have no idea. I love reading and immersing myself in the worlds and adventures with the pages of my ever growing collection. I mean, I have a reading room as part of my bedroom suite plus we have a House library and that’s not even counting the fact I have both a Kindle and a Nook. Music would have to be everything! Though, right now I’m really into Godsmack, Muse, and Blue October. I don’t really watch many movies . . . preferring to read and ‘watch’ the story of the book in my head. I do really enjoy some of the more cult classic movies Nicholas and Declán have introduced me to though, especially Princess Bride and the Rocky Horror Picture Show. Nicholas: Oddly, I’d have to say Alice in Wonderland and Through the Looking Glass, I think. Probably considered an odd answer from a nearly 200 year old guy, but I just love the insanity and logic of Wonderland. Most of my preferred music choice fall under Mozart, Beethoven, or anything from the Phantom of the Opera – and yes, that’s also my favourite play and movie. Not odd at all Nicholas, it’s a classic~ And Phantom of the Opera is amazing! On music . . . um, most anything. Just not hateful rap – like the angry kind that degrades women – or the really whiny country. I like some western though. The Man in Black was awesome! 😀 Especially when he did all the alternative covers and such not long before he died. Gotta love Hurt when he did it. Movie? Right now would still have to be E.T. but the original version . . . not the reedited one that’s out now. Haha, a little geeky goes a long way! I for one love my boys with a little bit of geek and nerd. 😛 AND oh yes, The Man in Black~ (E.T. was an awesome movie). To see the entire Interview with Anya, Nicholas, and Declan from the House Millar series, visit Breaking Bookshelves by clicking on any banner or by clicking HERE. Make sure to leave questions and comments . . . Anya, Nic, and Dec have promised to drop by and answer reader questions . . . so get to typing!